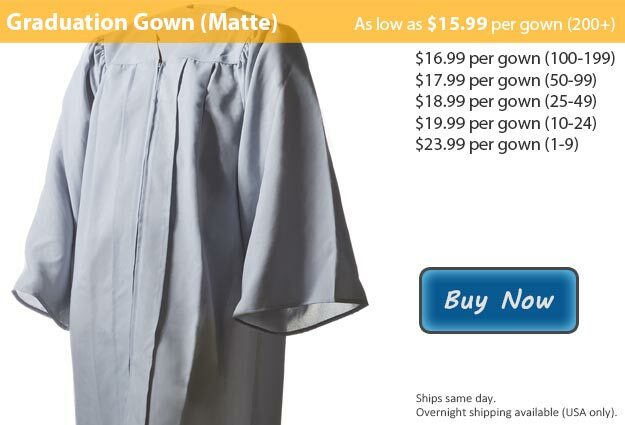 Matte silver graduation gowns are a fantastic choice to represent yourself this graduation. Students finishing their degree in communication studies have been known to wear our matte silver to signify their accomplishment. Successfully reaching your graduation is not an easy job to accomplish. You have done all of the leg work to make it this far and you deserve to be recognized for your dedication. Graduation is a time for celebration. It is a time when your family and close friends come from all over to honor you for all of your hard work and help you to enjoy your party. As you accept your diploma or other degree at your graduation ceremony you are turning the page in the book of life and starting a whole new chapter. Here at Honors Graduation we have everything that you might be looking for to have you ready for your unforgettable day in no time. Graduating students most commonly wear a cap and gown at the time of their ceremony, typically accented by some sort of graduation accessory such as a cord or tassel. At Honors Graduation it is our objective to help you prepare for your graduation. We have all the graduation gear that you need, from memorabilia and accessories to the items you can't go without. Our Cap & Robe + Tassel deal includes the essentials for graduation in one convenent package for quick and easy shopping. You will receive your matte silver graduation robe with the matching cap and a free tassel of your color choice. You can also find each of our items sold separately as well. Each of our robes finished in matte is available with a shiny finish as well. When you purchase your graduation cap from Honors Graduation we will toss in the tassel you choose at no additional cost to you. This graduation robe is also available in Silver Shiny Fabric.